As you can tell from my blog, I really like Monterey. The Monterey Bay Peninsula is stunningly beautiful. 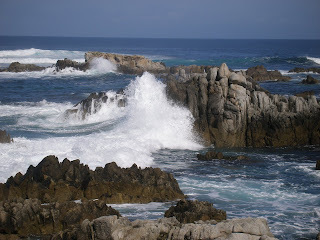 I especially love the area around Pacific Grove and the coastal areas of the 17 Mile Drive. 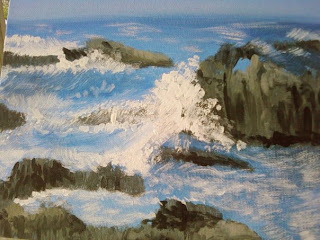 Below is one of my favorite photos of the crashing waves on the rocky outcroppings along the coastline. I have this photo framed and hanging on my living room wall. My goal for some time has been to paint it on a large canvas to hang over my bed. I find the crashing waves to by quite soothing and could sit all day just watching them. So, I thought having a picture of one of my favorite scenes hang above my bed would be just as soothing. Since the wall space is rather broad (I have a king-sized bed) I couldn't just enlarge my photo without some distortion. Therefore, in order to have my favorite scene hang there, I need to paint it. Since it's been quite a while since I painted a picture of any kind, I thought I would practice on a small scale first. The larger canvas is a little too pricey to to chance messing up, so I am simply following the old adage "practice makes perfect." To that effect I bought some paints and dug out a small canvas I had laying around the house. I painted the picture below the other night. I am quite happy with the results. However, I will still probably paint a few more practice canvases before tackling the large one for my bedroom. Nevertheless, I am very pleased and quite inspired to get back into painting.